Once a month Art Jewelry Elements hosts a component giveaway and reveal. May’s component was made by the talented Sue Kennedy of Sue Beads. Members of the Art Jewelry Elements team, plus several other artists were each given one of these gorgeous lampwork glass discs that Sue made for us. I received the disc at the top, with the orange center. I was so delighted, because orange is one of my favorite colors! Remember last month when I broke one of Jen’s lampwork glass headpins? This month’s Component of the Month was just the opposite experience. The necklace went together quickly and easily and I am rather pleased with it. 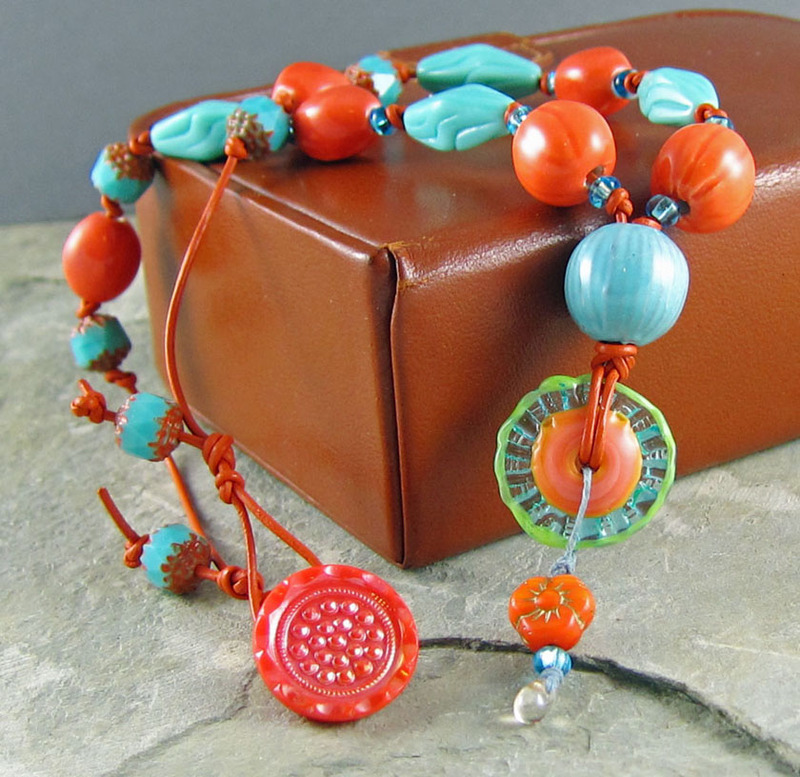 I strung the necklace on orange leather cording, attaching the lampwork disc with a larks head knot. Using waxed linen cording, I dangled a flower bead below the disc. The flower is accented with a turquoise seed bead and a tiny transparent, peach colored glass teardrop-shaped bead. 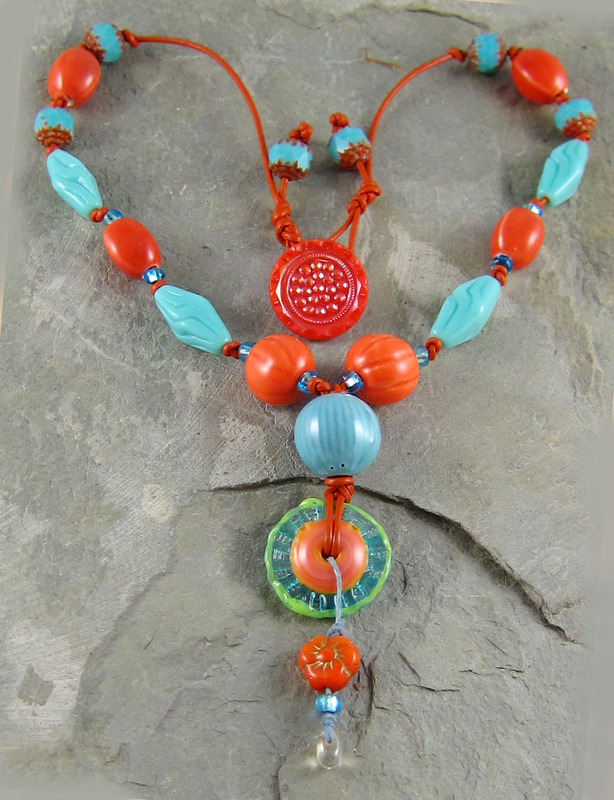 I placed a turquoise, enameled bead by Barbara Lewis, above the glass disc, completing the pendant portion of the necklace. The two round, orange ceramic beads were made by Bo Hulley. The rest of the ceramic and glass beads are commercially made. 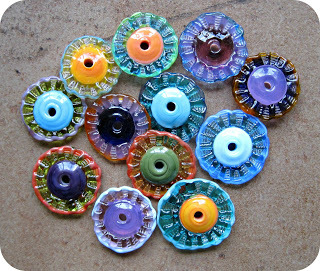 About 17 years ago, a bead shop near my parents’ house, bought out all the glass buttons from a defunct German button factory. I bought quite a supply of them back then at a very reasonable price. 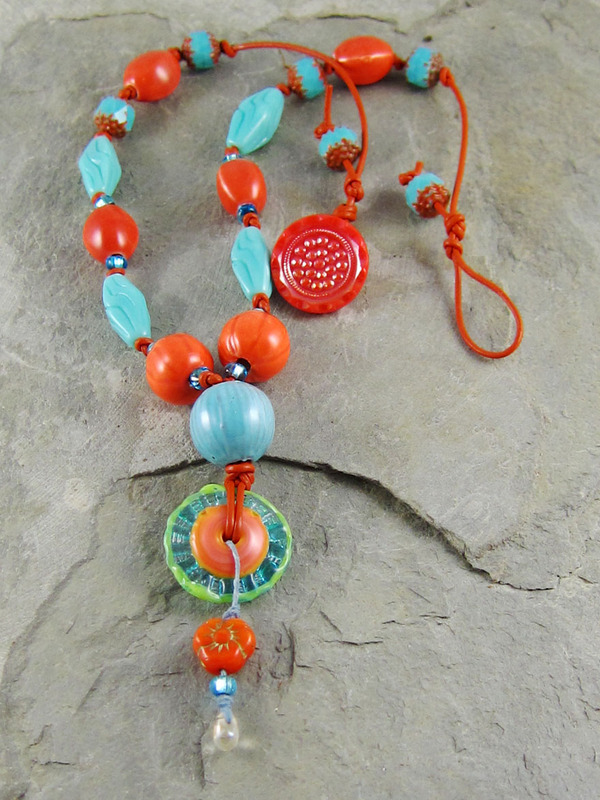 One of the orange glass buttons worked perfectly as a loop and button closure for this necklace. The necklace measures about 16.5 inches long and the enamel bead will be at about collarbone length on most people. I made this necklace on a gorgeous spring day. As I looked out my studio window, I noticed that the sky was a clear blue-turquoise, like the beads in the necklace. That’s how this necklace came to be named the “Blue Skies and Sunshine” necklace! Want to see more gorgeous jewelry with these lampwork discs? Head on over to Art Jewelry Elements for links to the other Component of the Month blog posts! P.S. My blog has a new template! Did you notice? Its a cleaner, more modern format. I’m still working on the heading banner and I need to update my blog roll, but I’m liking it. How about you? This entry was posted in Bead And Jewelry Challenges and tagged Art Beads, Art jewelry, Art Jewelry Elements, bead blog, blog hop, Component of the Month Challenge, fashion, lampwork glass discs, Linda Landig Jewelry, necklace, Sue Beads by Linda Landig. Bookmark the permalink. Very pretty Linda – a perfect summer creation. Te blog layout looks great too. Always beautiful Linda!! So bright and summery!!! Fantastic vivid and happy colors! Who would not like to wear this ?? 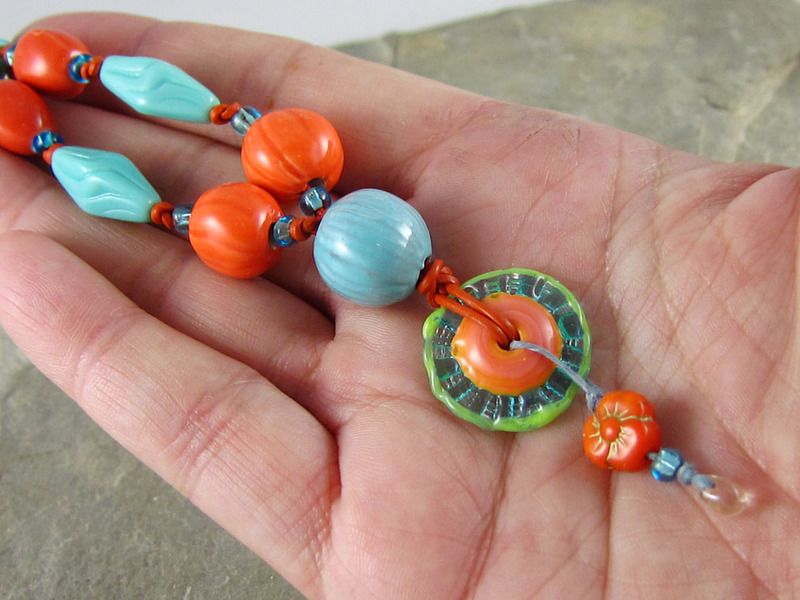 I love how the green in Sue’s bead pops against all that gorgeous turquoise and orange – really pretty! Blue skies and sunshine, indeed! Love that combination. Gorgeous, Linda, as always! Such a bright and colorful necklace! The orange leather and German button are such fantastic accents … really beautiful! Very pretty! I love the color combo. Very spring-y indeed! Very pretty. I love all the color in this and your bead/button closure. I love the beautiful color combinations and the orange leather. Well done! What a fun summer necklace! It’s just fabulous when a design falls together so nicely! Oh Linda!!!!!!!! So so so so pretty and you know how much I love orange right? Linda I love your necklace! It’s so fun and summery! Wow! It’s full of pop and zing! Love the button story! I love the colors of the pieces! You did a beautiful job, Sue’s ruffle discs are really NICE! I love your new blog template, too.